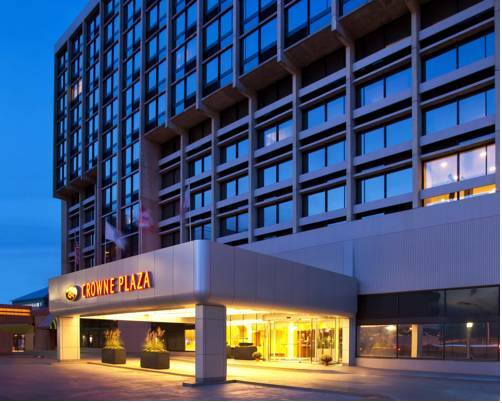 Landmark Boston Area Hotel Crowne Plaza Boston - Newtonhotel, uniquely situated over the Massachusetts Turnpike in lovely Newton Corner close to prominentuniversities and hospitals. Less than 5 miles to all the excitement and culture of Boston, minutes from Fenway Park, museums, the Charles river and convenient to Cambridge and Rt 95 and 495. Our location, on the MBTA route, provides direct access to all Boston area attractions. 270 spacious guest rooms have been stylishly redesigned and feature 37 inch HD flat screen TVs, complimentary high-speed Internet, room service and upgraded amenities. Our onsite Restaurant & Bar serving all-American breakfast. For a unique dining experience visit our adjacent Social Restaurant and Bar. Relax in our heated indoor pool or enjoy our state-of-the-art fitness facility. The on-site parking is available at $28.00 per day. Our convenient location makes the Crowne Plaza an ideal choice for meetings and special events. We feature over 8,000 square ft of newly remodeled event space, including an executive boardroom and stylish 4,000 square ft. ballroom with natural lighting. A dedicated catering manager will oversee every aspect of your planning and execution of a flawless event. When celebrating special occasions, think of the Crowne Plaza Newton with creative menus and packages for every taste. Lobby 320: Lobby 320 serves fresh, all American breakfast daily. Buff's Pub: Sports Bar Pub across the street from the Hotel. Well known for it's delicious chicken wings. Max & Leo's: Max and Leo's Coal Fired Pizza generally cooks in two or three minutes providing a crunch on the outside, a soft and moist texture inside, and perfectly caramelized toppings. Right across the street from the Hotel. Social Restaurant & Bar: A casual American Restaurant and Bar. Warm, inviting atmosphere and an attentive, friendly staff. Daily lunch and dinner featured menu items. Validated parking day and night. Live entertainment on Friday and Saturday nights. Social Restaurant & Bar: Perfect meeting spot for a cocktail after a long day of work. Social Restaurant & Bar offers a full cocktail menu, as well as lunch, dinner and pub food. Social is independently owned and operated. Charles Ballroom: The Charles Ballroom is 4000 square feet and can accomodate 300 people theatre style, 350 people reception, 130 people classroom and 240 rounds. University A: University A is 600 sq. ft.
University B: University B is 500 sq. ft.
University C: University C is 700 sq. ft.
Boston Room: The Boston Room is 700 sq. ft.
Newton Board Room: The Newton Boardroom is 600 sq. ft. and has a conference table for 12. The Shops at Chestnut HillShopping Mall in Newton, MA. Harvard SquareAt the center of Harvard University.